Forum Index > Off-topic Talk > Plate and Scale together? Posted: Thu 10 Dec, 2009 5:31 am Post subject: Plate and Scale together? Below is a picture of the rear of my kit. As can be seen I have Maile Covering the skirt of the backplate. I was considering making that rear skirt scale instead of maile. The purpose is to reduce weight and if possible to make the rear portion of the kit more appealing to the eyes. I am more interested in getting the kit as close to historically accurate as I personally can, and this is where I need the assistance of the fine people here. 1. Would this combination of plate, maile, and scale be at all historical in any way? 2. Should I replace the rear leggings with scale in place of the maile as well? This is the scales I would purchase and they would be afixed to a padded garment. Hmm, to tell the truth I have never seen scale used in such way - what I would suggest to do is to get that part of your set done from riveted mail. Scale at the back of the legs would probably hang " funny " or not be very flexible or comfortable to sit on. A scale skirt might not be too bad but I still wonder about comfort if sitting on a horse ? So it might work with armour meant to be used on foot but since period knights would still be riding into battle even if they were planning to fight on foot it would still be a problem if scales don't fold the right way to be able to sit on them. A scale skirt if spilt front and back might allow sitting on a saddle without sitting on the scales. There is a breast and back plate shown with scale fauld in an armourers workshoppe ( painting c. end of the 15th century ) on the cover of this book http://www.amazon.com/exec/obidos/ASIN/080207...etdiscuss. Unfortunately amazon does not have an image of the book. I've seen several other images ( woodcuts/paintings ect. ) that depict them. They don't seem to have been common but based on artwork were done. So given those rather preliminary conclusions I have been thinking where scale might be most advantageous over mail (or combined with mail). My initial thoughts are that Jean is probably right about the stiffness on a culet of scale (skirt around your backside). Might be a bit awkward to sit on even with a rather flexible backing. however a skirt of scale would work well for fighting on foot imo. I have considered making one as well. Posted: Thu 10 Dec, 2009 3:02 pm Post subject: Re: Plate and Scale together? I was pleasently surprised to see several of them in 1612 when watched it. Very interesting to watch you develop your harness over the past months. Concerning the use of scale; other than effigys I don't recall seeing such a combination. Agree with comments from both Chuck and Jean. Apparently your rig is intended to be a horseman's harness and not designed specifically for foot combat. The mail brayette or skirt is proper as your backside would look like hamburger after a very short ride. Attaching a fauld of 4-5 lames to the backplate is my only suggestion. I'm sure that Allan is a whiz at doing this sort of work. Also perhaps small tasset type plates just behind the tassets to protect the hips. If you PM me with your address, I will send you a lance rest for your kit...honest to Pete...no charge. 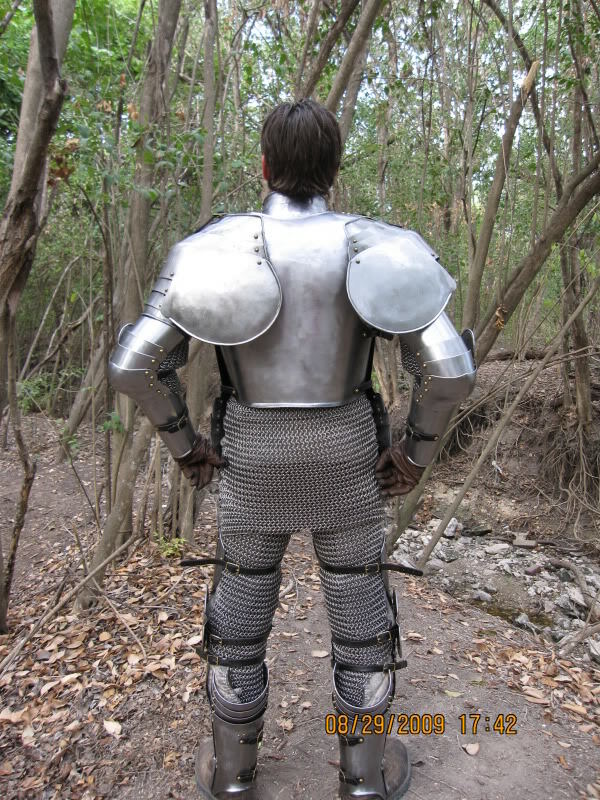 This B&B plates are based of sets from the Rhodes armoury ( worked from the book Armor from Medieval Rhodes ) that are predominantly from the second half of the 15th century and none of the back plates we worked from had faulds ( breast plate only, there were several gothic back plates that did which obviously we weren't working off of ), consequently the flange on the back plate is not large enough to accept them as the originals from which we worked didn't. One detail we did omit which was almost universal was that these back plates were constructed from three parts, a central plate and two side plates. Wheather this was a factor in why they did not have faulds in back I don't know but I suspect it has more to do with the fact that these armours were largely munitions products for infantry . Here http://homepages.tig.com.au/~dispater/armourers3.htm is the image from the book cover mentioned above. The B&B plates with scale fauld is on the right on the floor. Circa second half of 15th century.